Two Israeli families accidentally entered the Qalandiya refugee camp and were pelted with stones on Saturday. "We already said our last prayers," one of the passengers said. They eventually found their way out with the help of a Palestinian gas station worker. Two couples and their five children, the oldest aged six and the youngest 11 months, drove on Route 443 towards Atarot after returning from a bar mitzva on Saturday. They lost their way after making a wrong turn and ended up at the Qalandiya refugee camp, where they claim to have been pelted with stones for half an hour. One of the drivers told Ynet that no one checked their vehicles when they crossed the checkpoint towards the wrong direction. "The soldiers only checked those driving on the other direction. A minute after we passed the checkpoint, we saw cars with blue license plates and realized we were in the wrong place. We made a U-turn but then the Palestinians realized we are Israelis. I locked the doors, but my brother-in-law didn’t make it on time. 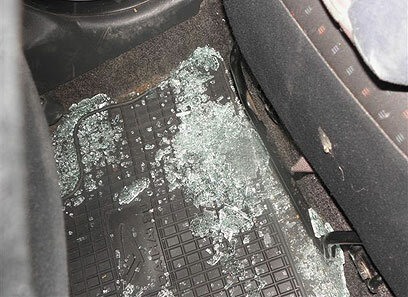 They opened his car doors, threw stones and started climbing on his car." At that point the two families decided to head into the refugee camp in what may have eventually saved their lives. "We ran, we couldn’t drive towards the exit, but we realized we had to stay in motion." So as not to get lost, they drove along the separation fence. "We drove back and forth at least five times." 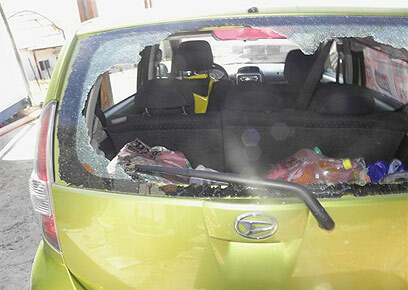 During this time Palestinians hurled several large stones at the vehicles, one of which smashed the back window shield of one of the cars and landed on a booster chair where one of the kids had been sitting. "A few moments earlier we dropped the kids onto the car floor. Had the child still been sitting there, you would have been publishing his picture today," one of the mothers related. "We prayed, they knew we were there and they waited for us each time we drove past," she said. "They had giant rocks and murder in their eyes. It's not fear, it's crazed horror one cannot imagine. I was afraid they'd yank the kids out of the car." The two families stayed in constant contact with an IDF special war room and police officials. A Palestinian gas station worker finally helped them find their way out and talked to the police officer who was on the phone with them. One of the men was carrying a gun, but chose not to use it. "I knew that if I fired I was inviting them to murder me and that we mustn't draw attention and stir up the whole village," he said. The families complained that there were no clear signs warning drivers from entering Palestinian territory and noted that police and IDF forces took a long time to understand where they were. The IDF Spokesman's Unit confirmed the report and explained that the families entered Area B which isn’t banned to Israelis. It was stated that citizens were responsible for driving vigilantly in the area. See all talkbacks "2 families attacked in Qalandiya after losing their way"